Our sales are up 120% this year for the same time period - and we are in a recession! Yes increase of 120%! I am a happy Bridal network customer! Just wanted to say thanks for helping us against harmful scams. It's greatly appreciated and says a lot about your values and work ethics. Thank you!!!!! I'm Very impressed. I'm actually quite impressed with the email alerts. You have absolutely taken the steps to rise above the rest and actually take a care and an interest in your patrons with Bridal Network... too bad more companies/people were not like you! Kudos!!! 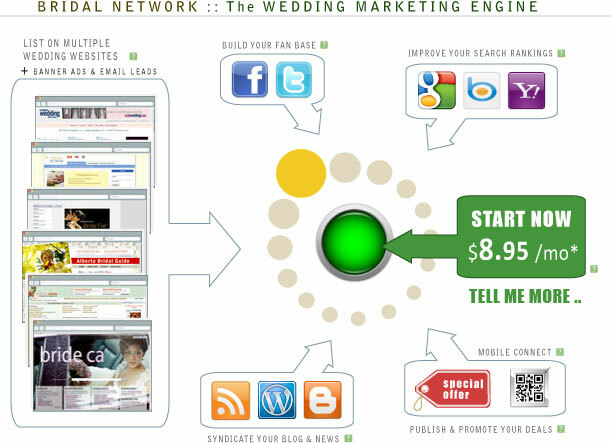 Bridal Network is just the BEST! From the very start when I chose to put my company on your web, I had more interest than any other 'advertising' I'd done in the past and spent loads of money. I've paid a modest sum and I can not believe the action. You are always thinking of us out there and it really shows! ..I just wanted to give you a big heart felt THANK YOU! Keep doing what you do best because it allows us to do what we do best! Thank you so much for the amazing service! You've gone above and beyond the call of duty to help me out. I'm very impressed and greatful with the customer service you guys provide. I will definately recommend you guys if I ever come across anyone who's not already using you. Wow! I am impressed...this is the only website that I am linked to that takes the time to aid its vendors like this! I would like to thank you very much for following up on this ...keep up the good work! Hi, thanks for such interesting and useful information. Your past two emails have been probably the only useful info I've received from the "wedding industry" in the last 5 years. Preferred placements available with pay-per-click. - including page "like" to build fans. - including "follow" link to build fans. are "natural", "follow", web links. One service listed + its blog = 25+ links! - your blog posts syndicated = more links. All your network listings also link to your blog & recent posts. i.e. brides-to-be can readily browse your news & recent portfolio. Most Bridal Network sites include some version of "Bridal Buzz"
- the lastest & greatest in the wedding bloggosphere, locally. on all our websites, through your listings and our dedicated lists. Web-enable your print-ads, business materials, store-front..
view your portfolio, request an appointment. - or contact us for custom pricing.